Third Millennium Press Ltd has been a family business since 1997. 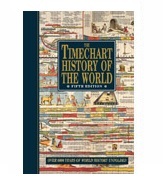 Founded on the extraordinary success of the single title “Timechart History of the World” which has sold, over six editions, a total of 800,000 copies in English and ten other languages – with the lion's share being published in USA and Germany. The British Museum is the major retail sales outlet in the UK. “The Timechart of Biblical History” was the second publication and has sold some 400,000 copies since 2002 – the English language version having been reprinted 28 times. Uniquely combining both biblical and world history, TMP developed further titles in the same traditional style for those families and individuals committed to the Holy Bible and its teachings. For the future TMP will largely dedicate its publishing to Bible based books and charts always illustrated in similar style.